Last meal in Singapore: nasi lemak at the Ponggol Nasi Lemak Centre, originally uploaded by nina_theevilone. Read about this place from Kenny Sia‘s and Carls Palma‘s blogs. Kovan was actually pretty near my brother’s place, so I figured I’ll try it out since I’ve been craving for nasi lemak. 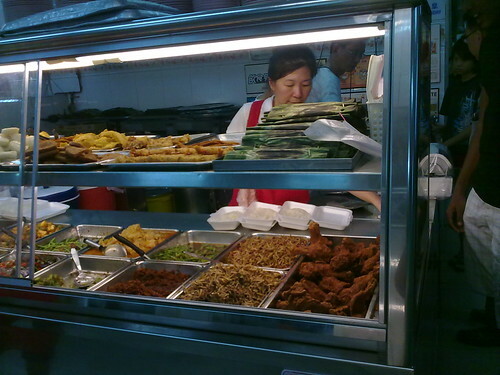 This one is a make your own nasi lemak, where you can put as many or as little viands with your rice. The rice is so good. You can really taste the coconut cream. If you don’t like spicy food, no need to worry because there’s plenty of non-spicy choices. Definitely worth the SG$6.50 price tag and 30 minute wait. I miss the lengthy entries. Bring your laptop!!! hehehhe. Haha, sorry naman! I needed to take a break from the laptop (and the Internet) kasi. Don’t worry, the long posts are coming up! Are you back from outer space na? Hehe Are you staying for the Singapore Grand Prix? wow, this is near our place! is it nice here? amazing, i always see a long queue here whenever i pass by the place!